East Prussia, diaspora in Germany. 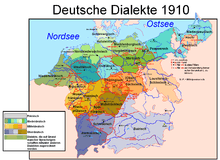 High Prussian (German: Hochpreußisch) is the group of East Central German dialects in former East Prussia, in present-day Warmian-Masurian Voivodeship, Poland. High Prussian developed in the 13th–15th centuries, brought in by German settlers mainly from Silesia and Thuringia, and was influenced by the Baltic Old Prussian language. High Prussian dialects were mostly spoken in the Catholic region of Warmia and the adjacent East Prussian Oberland region beyond the Passarge River in the west (around Preußisch Holland and Mohrungen), subdivided into Breslausch (from Silesian Breslau) and Oberländisch. They were separated from the Low Prussian dialect area by the Benrath line isogloss in the west, north and east; in the south they bordered on the Polish Masurian dialect region. Like Silesian German, High Prussian is moribund due to the evacuation and expulsion of the German-speaking population from the Province of East Prussia during and after World War II. The dialect has few remaining speakers today. ↑ Hammarström, Harald; Forkel, Robert; Haspelmath, Martin; Bank, Sebastian, eds. (2016). "High East Prussian". Glottolog 2.7. Jena: Max Planck Institute for the Science of Human History. Wikimedia Commons has media related to High Prussian.